Triatek attended the 2015 Laboratory Design Conference held at the Hyatt Regency in Atlanta. It was a great opportunity for our sales and engineering team to meet with lab facility managers and end users from around the world. 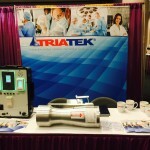 We showcased Triatek’s cutting edge laboratory solutions including our Venturi Valves, VAV Controllers, and HMS-1655 line of fume hood controllers.